Mineral makeup is not new to the cosmetics industry; hitting the commercial market in the mid-70’s, it’s popularity has steadily increased with consumers’ awareness of dangerous chemicals and their desire for safe, natural products. Pure mineral makeup provides many benefits because it is water-resistant, anti-inflammatory, and anti-microbial, making it a perfect solution for people struggling with acne-prone skin or rosacea. It doesn’t contain oils, fragrance or preservatives that irritate sensitive skin and aggravate existing conditions and it is non-comedogenic so it won’t clog pores. These properties make mineral makeup a perfect choice for patients that have had a chemical peel or laser resurfacing and need to allow time for their skin to heal post-procedure. To benefit from all mineral makeup has to offer, it is crucial to use pure mineral make-up rather than a mineral-based product. Pure mineral makeup will contain zinc oxide and titanium oxide as the first two ingredients versus mineral-based products which will contain significant amounts of talc or preservatives used as fillers. Doctors often discourage the use of these additives after cosmetic procedures because they increase peeling and drying of the skin. The minerals also serve as a natural SPF 20 sunscreen to protect your skin. Unlike chemical sunscreens that absorb ultraviolet radiation, the zinc oxide or titanium oxide work as a “physical” sunscreen by reflecting ultraviolet radiation away from the skin. Using pure mineral makeup in conjunction with a daily sunscreen is the best way to enhance your skin protection beautifully. In addition to all the benefits to your skin, mineral makeup looks great! Mineral makeup’s fine pigments blend easily on the skin and possess reflective properties that create a flawless glow. Even those with rosacea, blemished, or aged skin can have the appearance of healthy, radiant, youthful skin. 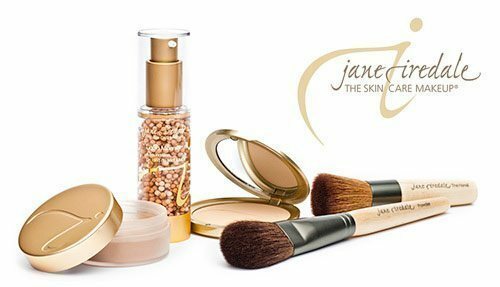 Pure mineral makeup like Jane Iredale’s line of mineral foundations and powders are made without fillers and preservatives, using only the beneficial properties of micronized inorganic compounds zinc oxide and titanium dioxide to enhance the skin naturally. Jane Iredale products are 100% organic, made without talc, FD&C dyes, synthetic preservatives, parabens, or synthetic fragrance and are certified cruelty-free by PETA. Whether you are looking for products to use post-procedure, or you just want to attain beautiful skin, pure mineral makeup, packed with tons of natural benefits, is the best way to achieve a flawless, youthful glow while pampering your skin. Call Dr. Shapiro’s Skin Klinic (480) 451-1700 today to find out more about how pure mineral makeup can help you get beautiful skin naturally.